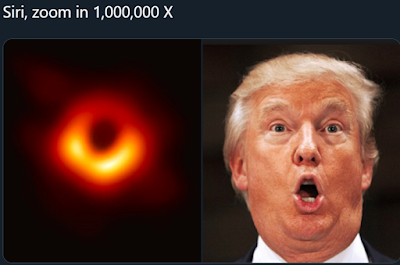 I can't believe it took a team of 200 astronomers in 20 countries, working together for over a decade to find the first image of a gaping black hole 55 million light-years away from Earth. I bet they feel fairly foolish at this point. If it were actually 55 million miles from earth I’d be much more content, however it appears to be right here in our White House. The hole on the left looks more intelligent. I like the expression 'he's like a giant black hole of endless emotional needs" - seems apt here 2x.